Anyone else thinking about their Thanksgiving menu yet? My husband and I are celebrating on a couple of different days this year, and one of those days is next Sunday, so I wanted to get a head start on some Thanksgiving prep today. The challenge: stuffing. 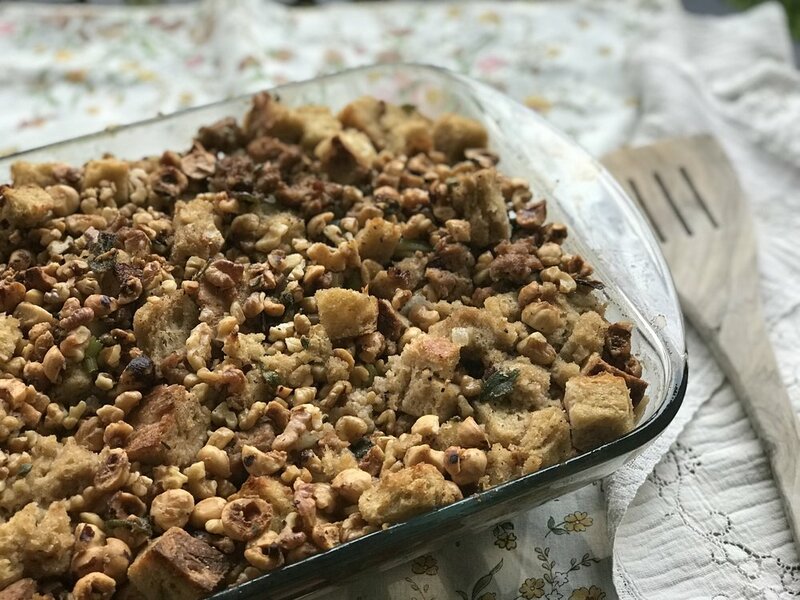 Stuffing is one of those things I'm never super excited about initially, because I feel like there are only so many ways to make stuffing taste different, but then I remembered it's just an excuse to spoon a bunch of bread into your mouth! So, the bread. I made my own, because that's what I do, using this No-Knead recipe. Make a double batch if you're serving more than 4 people. If you buy it, get two large loaves, something yummy you'd eat on its own. I used half wheat flour and half white flour when making mine, to get a little more whole grain chew in there, but just about any kind of bread works. One weird thing: I don't like mushrooms, but I like the flavor they impart. The solution? Cook mushrooms, let them steep in some stock, then use that yummy brown liquid to flavor the stuffing. Umami, baby! Make this now, let it cool completely, wrap it tightly with plastic wrap and pop it into your freezer. On Thanksgiving, take it out of the freezer and let it sit at room temperature for about an hour. Splash some chicken/veggie/turkey broth or stock over the top, and cook in a 425-degree oven for about 15 minutes, until it's heated through. It'll taste like it was made that morning. Place bread in the largest bowl you have, and preheat oven to 425 degrees. 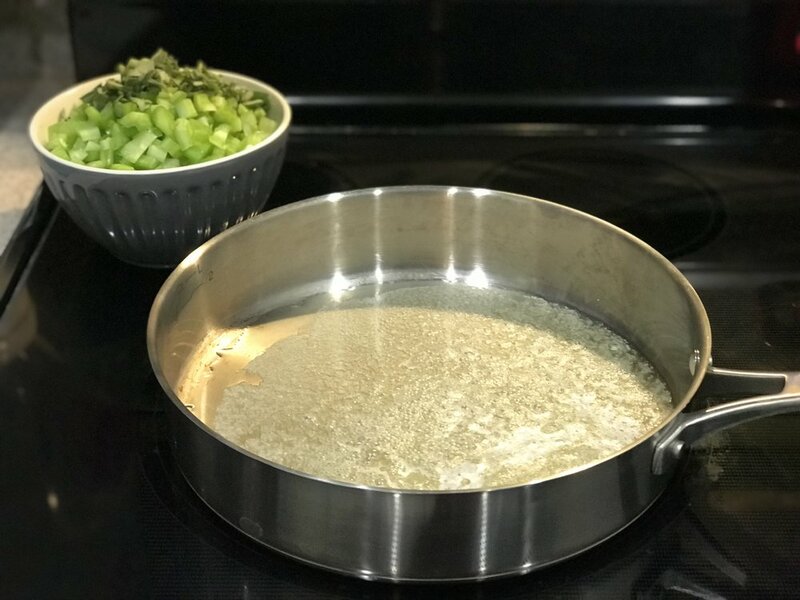 Melt butter in a large skillet, then add onion, celery, sage, and season with salt and pepper. Cook for about 10 minutes, until soft. When done, add to bowl with bread. Return skillet to heat and add mushrooms and a swirl of olive oil. Cook for about 15 minutes, until very brown. Add about 1/2 cup broth or stock and let simmer for a couple minutes. Strain liquid into bowl with bread and other ingredients. Set aside mushrooms for another use. Return the skillet to heat yet again and add the sausage, breaking it up and cooking until mostly brown. Add to bowl. Stir everything gently until it comes together. Add the rest of the stock, then pour into a greased 9- by 13-inch baking dish. Add more stock until all of the bread is wet and there is some stock pooling at the bottom of the dish. In the same skillet, cook hazelnuts, thyme and sage with a bit of butter and maple syrup. Season with salt and pepper, and cook for 5 minutes until toasty. Add to the top of the stuffing. Bake for about 25 minutes, until most of the stock is absorbed and bread and topping is getting crispy. Eat a couple bites because you are worth it, then let cool completely, wrap well in plastic and freeze until ready to eat. Are you on Instagram? Follow me at @michellestark17 for cooking videos! Here's one I did for this stuffing, if you want to peep it here.